Fastlane: Mystery and Suspense on Television. 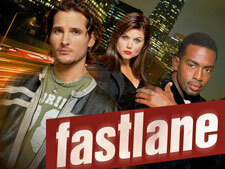 Fastlane starred Peter Facinelli and Bill Bellamy as two renegade cops, one an LAPD officer, the other a former gang member now NYPD narcotics cop, who go undercover using cars, jewelry, weapons, and other items confiscated from criminals by the police to catch other criminals in Los Angeles. The series aired just one season on Fox during the 2002 / 2003 television season, cancelled not for lack of ratings but reportedly due to the exceptionally high production costs for each episode.